TFCF has recruited volunteers to join international voluntary service since the early of 2015. The candidates of the First TFCF International Volunteer Program to Kyrgyzstan were all vulnerable children supported by TFCF branches in Taiwan. There were 8 youths taking international aid (development) courses for six months before participating in Kyrgyzstan community services for local children and youth in need from July 29 to August 13, 2015. The services included Cultural Exchange, Growth Group and Children’s Leading Camp. They had the best practices and shared their experiences and tips on building their lives. 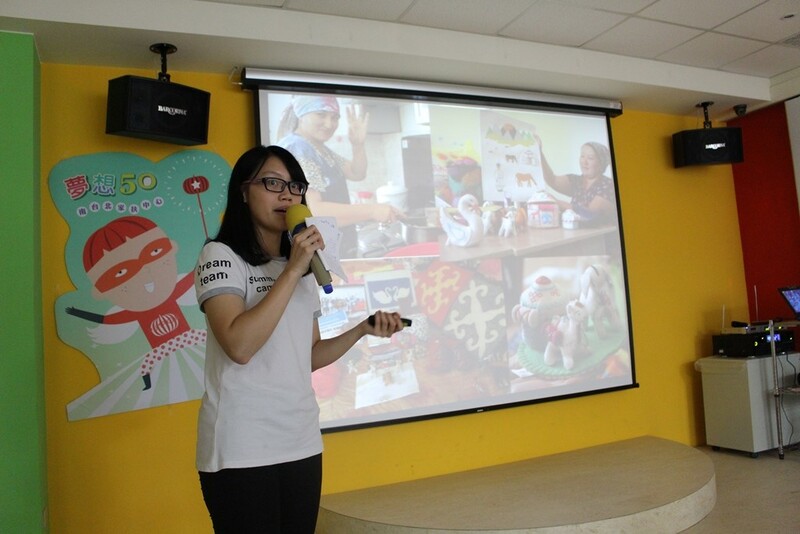 After the two-week program, the first TFCF International Volunteer Program Showcase will be held at Pumpkin House work station in Southern Taipei City Branch on October 25. People may see the presentation of team members, including activity record video, their feedback and experience, the traditional food and dress of Kyrgyzstan. All youths from the team realize how a wonderful opportunity they were experiencing even it’s just a two-week program. A college student, Rong, said that “We want to help them as much as we can, and look forward to seeing their lives change better”. All of them admit that this was the best way to spend their summer vacation which they have learned international voluntary services. They all are willing to participate in the voluntary work and help more people globally in the future. They will share their stories with more people and make a positive impact in the society. TFCF CEO, Ms. Ho said, “I am so touched and moved while seeing this showcase”. TFCF International Volunteer Program provides the opportunities for members to learn from different cultures, broaden and light up their outlook upon the world. As the role of TFCF International Volunteer Program, in addition to focusing on youths learning from voluntary services and broadening their worldview, it leads to a consistently greater accumulation of practice and draws public attention to vulnerable children in the world. In 2004, TFCF started our sponsorship program abroad and established the first overseas Branch Office in Mongolia. Afterwards, we established four more overseas Branch Offices in Kyrgyzstan (2012), Swaziland (2013), Vietnam (2014) and Cambodia (2015). There are around 800 children still waiting for the sponsors in TFCF Mongolia, Kyrgyzstan and Swaziland Branches. We would like to invite people to lend a helping hand and give opportunities to change their lives. If you are interested in this program, please contact TFCF foreign sponsorship department by calling our sponsorship hotline: (04) 22061234 ext. 157.